Rossvile flats were one of Derry’s most notable landmarks from the sixties through to the eighties. Mackel remarks in his Troubles Archive Essay that the NIHE provided “solutions to the problems of both large areas of poor housing - [with] a built response to our impoverished understanding of limited models of housing typologies of either two-up two-down terrace houses, semi-detached houses or slab and tower block constructions.” The Rossville flats in Derry city are of a slab construction, although the flats were inherited from the Londonderry Development Commission by the NIHE rather than built by it (they were built by the Housing Trust). The NIHE carried out various improvements and refurbishments on the flats over the years, the photograph showing the primary-coloured doors and panels between windows, dating from 1983, indicating the architectural composition to be capable of providing a lively external appearance (at least in sunshine), as a result the complex was locally known as “Derry’s Rubic Cube”. Brett said, “By the end of 1971 - conditions in Londonderry were still very bad - waiting lists hovering around 2,000 families or one-seventh of the population; there was gross overcrowding - the high Rossville flat-blocks, built in the early 1960s, were at first perfectly acceptable. But these were for the families displaced by redevelopment, not for those on the general waiting-lists, and did little to remedy the bitter frustration of the minority [Catholics]”. (Housing A Divided Community, p.67) The flats proved notorious during the Troubles, being the scene of some of the worst rioting from 1969 onwards and of Bloody Sunday in 1972. Brett wrote, “the violence… led to organized squatting, intimidation, and a massive movement of population, mostly of Protestants from the west to the east bank of the river Foyle, although simultaneously there was a reverse flow of Catholics moving from east to west in search of safety.” (Housing A Divided Community, p.67) In 1985 the Housing Executive made the decision to demolish block one of the flats. Although, it was not until 1986 that block one was demolished as tenants had to be relocated. The remaining housing blocks were knocked down in 1989. Now demolished, the flats were in Derry city, on the edge of the Bogside. Sectra-system concrete-based block of flats. 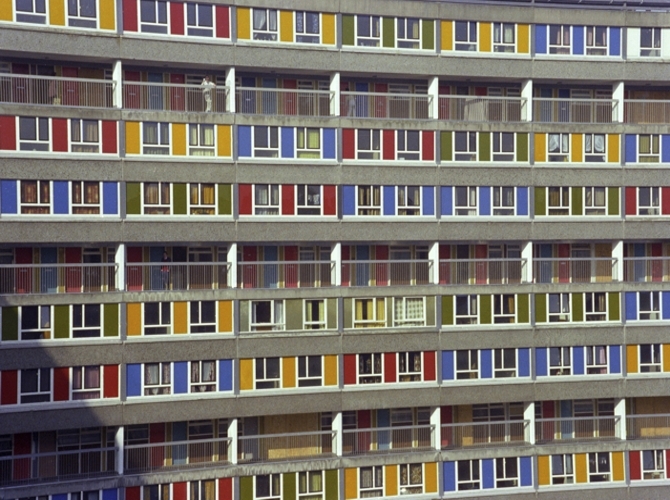 A large complex of interlinked high-rise flats with covered access walkways, following models from elsewhere in Britain and Europe.